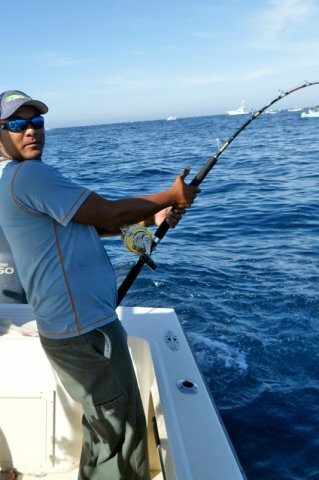 We don’t necessarily boast better fishing — we just boast a different culture of fishing that we believe has been lost in Cabo San Lucas. The water temperatures and presence of bait determine where the fish are. Though Cabo San Lucas is often considered the ‘tip’ of Baja, all you have to do is look at a map and you’ll see that the bottom of Baja California reaches a flat area that stretches from Cabo San Lucas around to San Jose del Cabo around the coast sixty miles to Los Barilles. 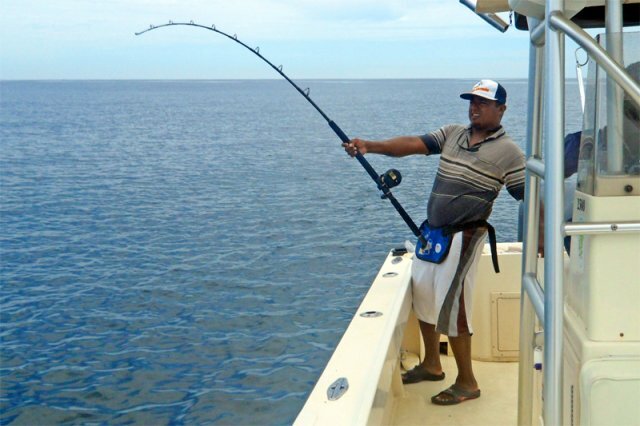 The mixing of the Pacific Ocean with the waters of the Sea of Cortez makes the general area one of the BEST fishing spots in the world. Don’t be fooled that ONE spot is the best to fish — success depends on currents, presence of bait, and time of year. 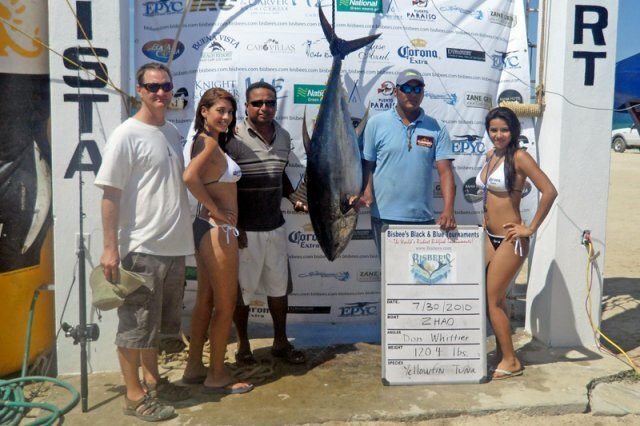 The 11th annual Bisbee’s East Cape Offshore Tournament wrapped up July 31st with a festive awards ceremony on the beach overlooking the Sea of Cortez. 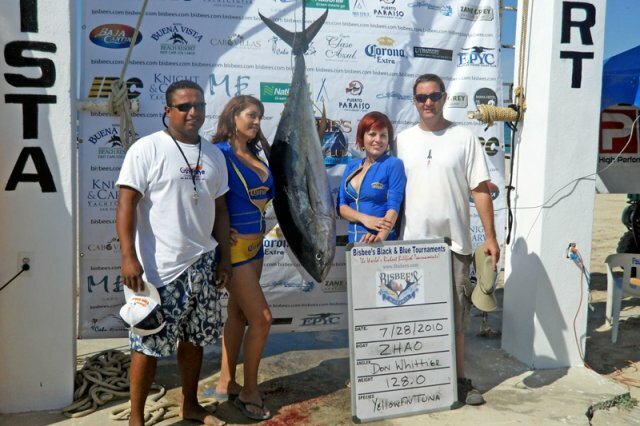 With three new tournament records set and more than $300,00Dream Weaver - Top Marlin0 in prize money awarded among the 56-boat field, the event was a resounding success. What is the cost of a charter? Our charters are ALL inclusive. Yes, you may get better prices with some of our competition, yet they don’t include the cost of the fishing license, the cost of bait, and the cost to clean your fish. We include all of these, plus snacks and drinks, in our one price. We want you to know the actual cost upfront so that you won’t be hit with 20 dollars here and 20 dollars there without being aware of it. The only undefined part of our trips are the tips for the captain or the person who cleans the fish. What’s not included in the price? Rides to and from your hotel, or tips for the service. Tips range from 10-20% depending on how well you feel your guide served you. All fishing gear and tackle is included in the cost of the charter. NOTE: We offer quality light tackle fishing equipment. All damage to equipment caused by abuse will be charged back to the client. Bring sunscreen, sunglasses, preferred drinks or snacks, cameras. Also try to arrive at the dock early, as a getting on the water as soon as possible makes for a better day of fishing. Can I split a trip with someone else? Yes you can pay a deposit and we will work hard to find you a person to split a trip with. Go to our reservations and make sure you fill out that you are wanting to split a a trip. 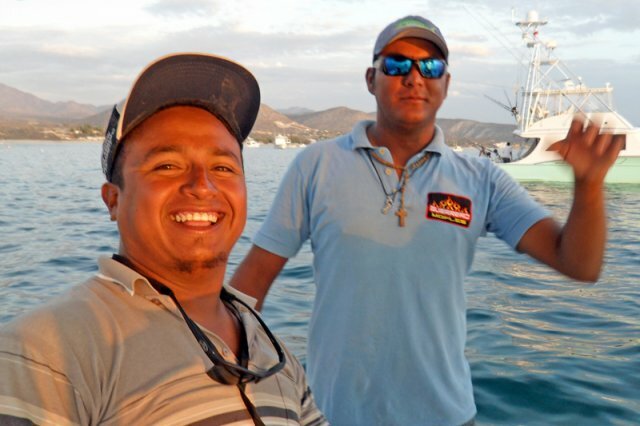 Charters leave at sunrise (6 – 7am depending on time of year) and return between 12:30 – 2:00, depending on the fishing and desires of the people on the boat. If you want to guarantee a trip with our service then, yes, you should make a reservation. Deposits are fully refundable if we are unable to provide the service due to weather or other unforeseen conditions. We have people who make reservations a year in advance. Getting booked now guarantees you’ll get one of our boats and our service. You will receive a full refund if you cancel your trip at least 30 days in advance. If you cancel your charter less than 30 days before your trip date and we are able to fill the boat with another charter for that date, we will refund your reservation fee. Reservations made — If we do not get another charter for the date you scheduled, you will be charged the fee of the reservation, as we took that boat out of availability specifically for you. Reservations within 14 days of a charter are non-refundable unless we are unable to fulfill our obligation to our clients. All refunds will be either charged back to the client’s credit card or via check within 60 days of cancellation. Yes. You may pay for your deposit and full charter by credit card, though all tips should be paid directly in cash. Do you supply food and drink? Yes. We bring basic snacks and drinks on each boat. If you have specific drinks or food you want, please feel free to bring them with you. Our captains do not drink alcohol during fishing charters and in order to provide the safest trips possible, we ask our clients to be mindful of their alcohol consumption while fishing with us. The hurricane season runs from August to September. If we are unable to provide service due to weather or other unforeseen circumstances, we will reimburse our clients 100%. Whom do I talk with about question or concerns?